Each of the Hopi clans preserves a separate origin or emergence myth, agreeing in all essential parts, but carrying in its details special reference to its own clan. All of them claim, however, a common origin in the interior of the earth, and although the place of emergence to the surface is set in widely separated localities, they agree in maintaining this to be the fourth plane on which mankind has existed. The following is an abbreviation of the version gathered by A.M. Stephen, who lived many years among the Hopi and collected these sacred tales from the priests and old men of all the different villages some fifty years ago, as reported by Mindeleff. In the beginning all men lived together in the lowest depths, in a region of darkness and moisture; their bodies were mis-shapen and horrible and they suffered great misery. By appealing to Myuingwa (a vague conception of the god of the interior) and Baholinkonga (plumed serpent of enormous size, genius of water) their old men obtained a seed from which sprang a magic growth of cane. The cane grew to miraculous height and penetrated through a crevice in the roof overhead and mankind climbed to a higher plane. Here was dim light and some vegetation. Another magic cane brought them to a higher plane, with more light and vegetation, and here was the creation of the animal kingdom. Singing was always the chief magic for creating anything. In like manner, they rose to the fourth stage or earth; some say by a pine tree, others say through the hollow cylinder of a great reed or rush. This emergence was accompanied by singing, some say by the Magic Twins, the two little war gods, others say by the mocking bird. At any rate, it is important to observe that when the song ran out, no more people could get through and many had to remain behind. However, the outlet through which man came has never been closed, and Myuingwa sends through it the germs of all living things. It is still symbolized, Stephen says, by the peculiar construction of the hatchway of the kiva, in designs on the kiva sand altars, and by the unconnected circle on pottery, basketry, and textiles. Doubtless the most direct representation of this opening to the underworld is the sipapu or ceremonial small round opening in the floor of the kiva, which all Hopi, without exception, agree symbolizes the opening or spirit passage to the underworld. "Out of the sipapu we all came," they say, "and back to the underworld, through the sipapu, we shall go when we die." Once every year the Hopi hold an eight-day ceremony commemorating this emergence from the underworld. It is called the Wu-wu-che-ma, occurs in November and thus begins the series of Winter festivals. Four societies take part, and the Da-dow-Kiam or Mocking Bird Society opens the ceremony by singing into the kiva of the One-Horned Society this emergence song, the very song sung by the mocking bird at the original emergence, according to Voth. This ceremony is a prayer to the powers of the underworld for prosperity and for germination of new life, human, animal, and vegetable. Fewkes called this the New Fire Ceremony, and in the course of the eight-day ceremonial the kindling of new fire with the primitive firestick does take place. But it is not hard to feel a close relation between the idea of fire and that of germination which stands out as the chief idea in the whole ritual, particularly in the subtle dramatization of the underworld life and emergence as carried on in the kivas, preceding the public "dance" on the last day. Thus we have at least three distinct points in this one myth that account for three definite things we find the Hopi doing today: (1) Note that it was "our old men" who got from the gods the magic seed of the tall cane which brought relief to the people. To this day it is the old men who are looked up to and depended upon to direct the people in all important matters. "It was always that way." (2) While the magic song lasted the people came through the sipapu, but when the song ended no more could come through, and there was weeping and wailing. Singing is today the absolutely indispensable element in all magic rites. There may be variation in the details of some performances, but "unless you have the right song, it won't work." The Hopi solemnly affirm they have preserved their original emergence song, and you hear it today on the first morning of the Wu-wu-che-ma. (3) The sipapu seen today in the floor of the kiva or ceremonial chamber symbolizes the passage from which all mankind emerged from the underworld, so all the Hopi agree. The belief of the present-day Hopi that the dead return through the sipapu to the underworld is based firmly upon an extension of this myth, as told to Voth, for it furnishes a clear account of how the Hopi first became aware of this immortality. It seems that soon after they emerged from the underworld the son of their chief died, and the distressed father, believing that an evil one had come out of the sipapu with them and caused this death, tossed up a ball of meal and declared that the unlucky person upon whose head it descended should be thus discovered to be the guilty party and thrown back down into the underworld. The person thus discovered begged the father not to do this but to take a look down through the sipapu into the old realm and see there his son, quite alive and well. This he did, and so it was. On July 4, 1928, occurred the death of Supela, last of the Sun priests. Mr. Koptu, who had done some studies of this fine Hopi head, was in Supela's home town, Walpi, at the time of the old priest's passing. The people were suffering from a prolonged drouth, and since old Supela was soon to go through the sipapu to the underworld, where live the spirits who control rain and germination, he promised that he would without delay explain the situation to the gods and intercede for his people and that they might expect results immediately after his arrival there. Since his life had been duly religious and acceptable to the gods, it was the belief of both Supela and his friends that he would make the journey in four days, which is record time for the trip, when one has no obstacles in the way of atonements or punishments to work off en-route. Supela promised this, and the people looked for its fulfillment. Four days after Supela's death the long drouth was broken by a terrific rain storm accompanied by heavy thunder and lightning. Did the Hopi show astonishment? On the contrary they were aglow with satisfaction and exchanged felicitations on the dramatic assurance of Supela's having "gotten through" in four days. The most wonderful eulogy possible! It is indicated, in the story of Supela, that the Hopi believe that only the "pure in heart," so to speak, go straight to the abode of the spirits, whereas some may have to take much longer because of atonements or punishments for misdeeds. Their basis for this lies in a tradition regarding the visit of a Hopi youth to the underworld and his return to the earth with an account of having passed on the way many suffering individuals engaged in painful pursuits and unable to go on until the gods decreed they had suffered enough. He had also seen a great smoke arising from a pit where the hopelessly wicked were totally burned up. He was told to go back to his people and explain all these things and tell them to make many pahos (prayer-sticks) and live straight and the good spirits could be depended upon to help them with rain and germination. Voth records two variants of this legend. The migration myths of the various clans are entirely too numerous and too lengthy to be in their entirety included here. Every clan has its own, and even today keeps the story green in the minds of its children and celebrates its chief events, including arrival in Hopiland, with suitable ceremony. We are told that when all mankind came through the sipapu from the underworld, the various kinds of people were gathered together and given each a separate speech or language by the mocking bird, "who can talk every way." Then each group was given a path and started on its way by the Twin War Gods and their mother, the Spider Woman. The Hopi were taught how to build stone houses, and then the various clans dispersed, going separate ways. And after many many generations they arrived at their present destination from all directions and at different times. They brought corn with them from the underworld. It is generally agreed that the Snake people were the first to occupy the Tusayan region. There are many variations in the migration myths of the Snake people, but the most colorful version the writer has encountered is the one given to A.M. Stephen, fifty years ago, by the then oldest member of the Snake fraternity. A picturesque extract only is given here. It begins: "At the general dispersal, my people lived in snake skins, each family occupying a separate snake-skin bag, and all were hung on the end of a rainbow, which swung around until the end touched Navajo Mountain, where the bags dropped from it; and wherever their bags dropped, there was their house. After they arranged their bags they came out from them as men and women, and they then built a stone house which had five sides. "A brilliant star arose in the southwest, which would shine for a while and then disappear. The old men said, 'Beneath that star there must be people,' so they determined to travel toward it. They cut a staff and set it in the ground and watched till the star reached its top, then they started and traveled as long as the star shone; when it disappeared they halted. But the star did not shine every night, for sometimes many years elapsed before it appeared again. When this occurred, our people built houses during their halt; they built both round and square houses, and all the ruins between here and Navajo Mountain mark the places where our people lived. They waited till the star came to the top of the staff again, then they moved on, but many people were left in those houses and they followed afterward at various times. When our people reached Wipho (a spring a few miles north from Walpi) the star disappeared and has never been seen since." "The old men would not allow them to come in until Masauwu (god of the face of the earth) appeared and declared them to be good Hopitah. So they built houses adjoining ours and that made a fine large village. Then other Hopitah came in from time to time, and our people would say, 'Build here, or build there,' and portioned the land among the new-comers." The foregoing tradition furnishes the answer to two things one asks in Hopiland. First, why have these people, who by their traditions wandered from place to place since the beginning of time, only building and planting for a period sometimes short, sometimes a few generations, but not longer, they believe—why have they remained in their present approximate location for eight hundred years and perhaps much longer? The answer is their story of the star that led them for "many moves and many stops" but which never again appeared, to move them on, after they reached Walpi. The second point is: The Flute Dance, which is still held on the years alternating with the Snake Dance, is of what significance? It is the commemoration of the arrival of this Lenbaki group, a branch of the Horn people, and the performance of their special magic for rain-bringing, just as they demonstrated it to the original inhabitants of Walpi, by way of trial, before they were permitted to settle there. This Flute ceremony is one of the loveliest and most impressive in the whole Hopi calendar. And because it is one which most clearly illustrates this thesis, some detail of the ceremony will be given. From the accounts of many observers that of Hough has been chosen: "On the first day the sand altar is made and at night songs are begun. Within the kiva the interminable rites go on, and daily the cycle of songs accompanied with flutes is rehearsed. A messenger clad in an embroidered kilt and anointed with honey, runs, with flowing hair, to deposit prayer-sticks at the shrines, encircling the fields in his runs and coming nearer the pueblo on each circuit. 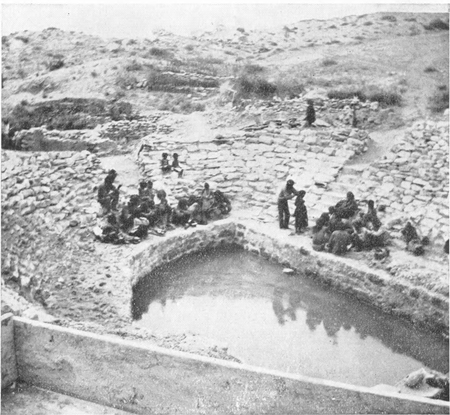 During the seventh and eighth days a visit is made to three important springs where ceremonies are held, and on the return of the priests they are received by an assemblage of the Bear and Snake Societies, the chiefs of which challenge them and tell them that if they are good people, as they claim, they can bring rain. "After an interesting interchange of ceremonies, the Flute priests return to their kiva to prepare for the public dance on the morrow. When at 3:00 a.m. the belt of Orion is at a certain place in the heavens, the priests file into the plaza, where a cottonwood bower has been erected over the shrine called the entrance to the underworld. Here the priests sing, accompanied with flutes, the shrine is ceremonially opened and prayer-sticks placed within, and they return to the kiva. At some of the pueblos there is a race up the mesa at dawn on the ninth day, as in other ceremonies. "On the evening of the ninth day the Flute procession forms and winds down the trail to the spring in order: A leader, the Snake maiden, two Snake youths, the priests, and in the rear a costumed warrior with bow and whizzer. At the spring they sit on the south side of the pool, and as one of the priests plays a flute the others sing, while one of their number wades into the spring, dives under water, and plants a prayer-stick in the muddy bottom. Then taking a flute he again wades into the spring and sounds it in the water to the four cardinal points. Meanwhile sunflowers and cornstalks have been brought to the spring by messengers. Each priest places the sunflowers on his head and each takes two cornstalks in his hands and the procession, two abreast, forms to ascend the mesa. A priest draws a line on the trail with white corn meal and across it three cloud symbols. The Flute children throw the offerings they hold in their hands upon the symbols, followed by the priests who sing to the sound of the flutes. 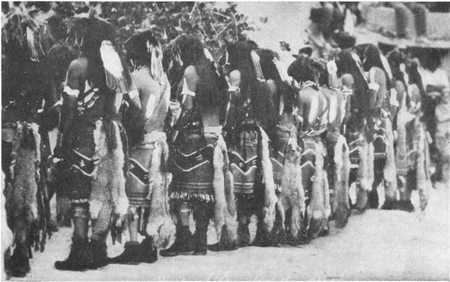 Figure 5.—Flute Ceremony at Michongnovi.—Courtesy Arizona State Museum. "The children pick the offerings from the ground with sticks held in their hands, and the same performance is repeated till they stand again in the plaza on the mesa before the cottonwood bower, where they sing melodious songs then disperse." Figure 6.—Flute Boy before Costuming.—Courtesy Arizona State Museum. On the ninth day women were observed sweeping the trail to the spring with meticulous care, in preparation for the double procession which came down at about 1:30 in the afternoon. All the costuming was done at the spring—body painting, putting on of ceremonial garments and arranging of hair. The fathers of the Flute maidens brushed and arranged their hair for them and put on their blankets. If a girl had no father, her uncle did this for her. There were two Flute Maids and a Flute Boy (See Figure 6) who walked between them, in each of the two fraternities. Even this ceremonial costuming was accompanied by solemn singing. When all was ready the priests sat on the edge of the pool with their legs hanging over, and the two maids and the boy sat behind them on a terrace of the bank. The Blue Flute fraternity occupied one side of the pool and the Drab Flute fraternity another. Many songs were sung to the strange, plaintive accompaniment of the flute players. After a while an old priest waded into the pool and walked around it in ever-narrowing circles till he reached the center, where he sank into the water and disappeared for a dramatically long moment and came up with a number of ceremonial objects in his hands, including a gourd bottle filled with water from the depths of the spring. It was late afternoon by the time all the songs had been sung, and evening when the two processions had finished their ceremonial ascent to the mesa top, pausing again and again as the old priest went ahead and drew his symbolic barrier of meal and the three rain clouds across the path, which were to be covered with the pahos of the Flute children, then taken up and moved on to the next like symbol. The old priest led the procession, the three children behind him, then the flute players, followed by the priests bearing emblems, and the priest with the bull roarer at the end of the line. Each fraternity preserved its own formation. Having reached the village plaza they marched to the Kisa and deposited their pahos and ceremonial offerings, then dispersed. The solemnity of the long ritual, the weird chant and the plaintive accompaniment of the flutes running through the whole ceremony, while at the spring, coming up the hill, and to the last act before the Kisa, leaves the imprint of its strange musical vibration long after the scene has closed. The legend back of this ceremony is a long account of the migrations of the Horn and Flute people. It relates that when they at last reached Walpi, they halted at a spring and sent a scout ahead to see if people were living there. He returned and reported that he had seen traces of other people. So the Flute people went forth to find them. When they came in sight of the houses of Walpi, they halted at the foot of the mesa, then began moving up the trail in ceremonial procession, with songs and the music of the flutes. Now the Bear and Snake people who lived in Walpi drew a line of meal across the trail, a warning understood by many primitives, and challenged the new-comers as to who they were, where they were going, and what they wanted. Then the Flute chief said, "We are of your blood, Hopi. Our hearts are good and our speech straight. We carry on our backs the tabernacle of the Flute Altar. We can cause rain to fall." Four times the demand was repeated, as the Flute people stood respectfully before the barrier of meal, and four times did their chief make the same reply. Then the Walpis erased the line of meal and the Flute people entered the pueblo, set up their altars and demonstrated their rain magic by singing their ceremonial Flute songs which resulted in bringing the needed rain. Then said the Bear and Snake chiefs, "Surely your chief shall be one of our chiefs." Thus we see that the Flute Dance as given today is a dramatization of this legend. Dr. Fewkes, who collected this legend, tells us that the Flute fraternity claims to be even more successful rain-makers than the world-famous Snake fraternity. Dr. Monsen tells of seeing the Flute ceremony at Mishongnovi, a good many years ago, and of the deeply religious feeling that pervaded the whole scene. His words are descriptive of a dramatic moment at the close of the day, when the procession had at last reached the public plaza on top of the mesa. Figure 7.—Hopi Girl in Butterfly Costume.—Photo by Lockett. "By this time it was nearly dark, but the ceremony went on in the center of the plaza where other mysterious symbols were outlined on the rocky floor with the strewn corn meal, and numbers of supplementary chants were sung until night closed down entirely and the moon appeared ... Then came something so extraordinary that I am aware that it will sound as if I were drawing on the rich stores of my imagination, for the coincidence which closed the festival. "But all I can say is that to my unutterable astonishment, it happened exactly as I tell it. At a certain stage in this part of the ceremony there was a pause. No one left the plaza, but every one stood as still as a graven image, and not a sound broke the hush, apparently of breathless expectancy. The stillness was so unearthly that it became oppressive, and a few white friends who were with me began to urge in whispers that we leave the plaza as all was evidently at an end, and go back to our camp below the mesa, when suddenly there rang out such a wild, exultant shout of unrestrained, unmeasured rejoicing as only Indians can give in moments of supreme religious exaltation—raindrops had splashed on devout, upturned faces. 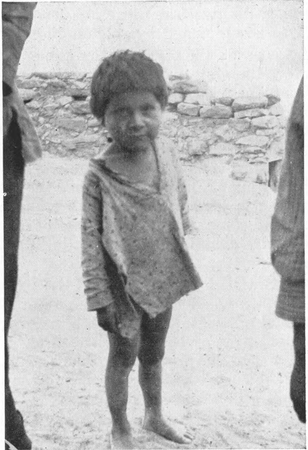 "From the white man's point of view, this answer to prayer was, of course, the merest coincidence, but not all the power of church or government combined could convince the Hopi that their god had not heard them ... that their devotion to the ancient faith had brought relief from famine, and life to themselves and their flocks and herds." The present-day Hopi, including the most intelligent and best educated of them, will tell you, that all their important dances and ceremonials follow faithfully the old traditions, and are still believed to be efficacious and necessary to the welfare of the people. And this has been the conviction of a majority of the scientific observers who have studied them. There is a very definite calendar arrangement of these ceremonials, some variation in the different villages, but no deviation in the order and essential details of the main dances. In December comes the Soyaluna, or winter solstice ceremony, to turn the sun back from his path of departure and insure his return with length of days to the Indian country. Good-will tokens are exchanged, not unlike our idea of Christmas cards, at the end of the ceremony; they are prayer tokens which are planted with prayers for health and prosperity. The kiva rituals are rich in symbolism and last eight days, if young men are to be initiated, otherwise four. The public dance at the end is a masked pageant. In January comes the Buffalo Dance, with masks representing buffalo, deer, mountain sheep, and the other big game animals. Its chief characters are the Hunter and the Buffalo Mother, or Mother of all big game. A prayer for plentiful big game is the idea of this dance. In February the Powamu, "bean sprouting," ceremony occurs, with very elaborate ritual signifying consecration of fields for planting. Various masks and symbolic costumes are used, and the children's initiation is accompanied with a ceremonial "flogging"—really a switching by kachinas. Dr. Dorsey considers this the most colorful of all Hopi ceremonies and says that nowhere else on earth can one see in nine days such a wealth of religious drama, such a pantheon of the gods represented by masked and costumed actors, such elaborate altars and beautiful sand mosaics, nor songs and myths sung and recited of such obvious archaic character, containing many old words and phrases whose meaning is no longer known even to the Hopi themselves. March brings the Palululong, "Great Plumed Serpent," a masked and elaborately costumed mystery play given in the kiva. This shows more of the dramatic ability and ingenuity of this people than any other of their ceremonies; the mechanical representation of snakes as actors being one of its astonishing features. This dance is really a very popular social affair, a sort of coming out party adopted from the Rio Grande Pueblos a good many years ago. The Snake Dance of the Hopi is, of course, the best known and most spectacular of their ceremonies, and comparatively few white people have seen any other. One hears from tourists on every hand, "Oh, they used to believe in these things, but of course they know better now, and at any rate it's all a commercial racket, a side show to attract tourists!" 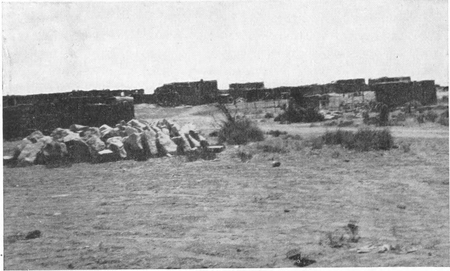 Figure 8.—Shungopovi, Second Mesa.—Photo by Lockett. Anyone who says this has seen little and thought less. The Hopi women make up extra supplies of baskets and pottery to offer for sale at the time of the Snake Dance because they know many tourists are coming to buy them, otherwise they get no revenue from the occasion. No admission is charged, and the snake priests themselves seriously object to having Hopi citizens charge anything for the use of improvised seats of boxes, etc., on the near-by house tops. The writer has seen tourists so crowd the roofs of the Hopi homes surrounding the dance plaza that she feared the roofs would give way, and has also observed that the resident family was sometimes crowded out of all "ring-side" seats. No wonder the small brown man of the house has in some cases charged for the seats. What white man would not? Yet the practice is considered unethical by the Hopi themselves and is being discontinued. We know that this weird, pagan Snake Dance was performed with deadly earnestness when white men first penetrated the forbidding wastelands that surround the Hopi. And we have every reason to believe that it has gone on for centuries, always as a prayer to the gods of the underworld and of nature for rain and the germination of their crops. The writer has observed these ceremonies in the various Hopi villages for the past twenty years, some with hundreds of spectators from all over the world, others in more remote villages, with but a mere handful of outsiders present. 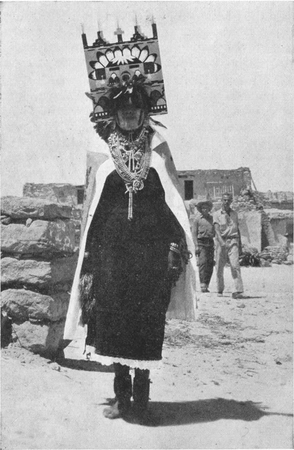 She is personally convinced that the Snake Dance is no show for tourists but a deeply significant religious ceremony performed definitely for the faithful fulfillment of traditional magic rites that have, all down the centuries, been depended upon to bring these desert-dwellers the life-saving rain and insure their crops. They have long put their trust in it, and they still do so. Are there any unbelievers? Yes, to be sure; but not so many as you might think. There are unbelievers in the best, of families, Methodist, Presbyterian, and Hopi, but the surprising thing is that there are so many believers, at least among the Hopi. The Snake Dance, so-called, is the culmination of an eight-days' ceremonial, an elaborate prayer for rain and for crops. Possibly something of the significance of parts of its complicated ritual may have been forgotten, for some of our thirst for knowledge on these points goes unquenched, in spite of the courteous explanations the Hopi give when our queries are sufficiently courteous and respectful to deserve answers. And possibly some of the things we ask about are "not for the public" and may refer to the secret rituals that take place in the kivas, as in connection with many of their major ceremonials. "To-ko-na-bi was a place of little rain, and the corn was weak. Tiyo, a youth of inquiring mind, set out to find where the rain water went to. This search led him into the Grand Canyon. Constructing a box out of a hollow cottonwood log, he gave himself to the waters of the Great Colorado. After a voyage of some days, the box stopped on the muddy shore of a great sea. Here he found the friendly Spider Woman who, perched behind his ear, directed him on his search. After a series of adventures, among which he joined the sun in his course across the sky, he was introduced into the kiva of the Snake people, men dressed in the skins of snakes. The Snake Chief said to Tiyo, 'Here we have an abundance of rain and corn; in your land there is but little; fasten these prayers in your breast; and these are the songs that you will sing and these are the prayer-sticks that you will make; and when you display the white and black on your body the rain will come.' He gave Tiyo part of everything in the kiva as well as two maidens clothed in fleecy clouds, one for his wife, and one as a wife for his brother. With this paraphernalia and the maidens, Tiyo ascended from the kiva. Parting from the Spider Woman, he gained the heights of To-ko-na-bi. He now instructed his people in the details of the Snake ceremony so that henceforth his people would be blessed with rain. The Snake Maidens, however, gave birth to Snakes which bit the children of To-ko-na-bi, who swelled up and died. Because of this, Tiyo and his family were forced to emigrate and on their travels taught the Snake rites to other clans." Most of the accounts tell us that later only human children were born to the pair, and these became the ancestors of the Snake Clan who, in their migrations, finally reached Walpi, where we now find them, the most spectacular rain-makers in the world. "On the fifth evening of the ceremony and for three succeeding evenings low clouds trailed over To-ko-na-bi, and Snake people from the underworld came from them and went into the kivas and ate corn pollen for food, and on leaving were not seen again. Each of four evenings brought a new group of Snake people, and on the following morning they were found in the valleys metamorphosed into reptiles of all kinds. On the ninth morning the Snake Maidens said: 'We understand this. Let the Younger Brothers (The Snake Society) go out and bring them all in and wash their heads, and let them dance with you.'" Thus we see in the ceremony an acknowledgment of the kinship of the snakes with the Hopi, both having descended from a common ancestress. And since the snakes are to take part in a religious ceremony, of course they must have their heads washed or baptized in preparation, exactly as must every Hopi who takes part in any ceremony. 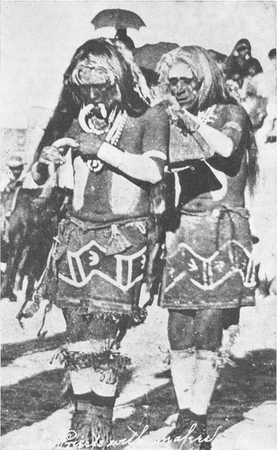 The meal sprinkled on the snakes during the dance and at its close is symbolic of the Hopi's prayers to the underworld spirits of seed germination; and thus the Elder Brothers bear away the prayers of the people and become their messengers to the gods, to whom the Elder Brothers are naturally closer, being in the ground, than are the Younger Brothers, who live above ground. Rather a delicately right idea, isn't it, this inviting of the Elder Brothers, however lowly, to this great religious ceremonial which commemorates the gift of rain-making, as bestowed by their common ancestress, and perpetuates the old ritual so long ago taught by the Snake Chief of the underworld to Tiyo, the Hopi youth who bravely set out to see where all the blessed rain water went, and came back with the still more blessed secrets of whence and how to make it come. Nine days before the public Snake Ceremony, the priests of the Antelope and Snake fraternities enter their respective kivas and hang over their hatchways the Natsi, a bunch of feathers, which, on the fifth day is replaced by a bow decorated with eagle feathers. This first day is occupied with the making of prayer-sticks and in the preparation of ceremonial paraphernalia. On the next four days, ceremonial snake hunts are conducted by the Snake men. Each day in a different quarter of the world, first north, next day west, then south, then east. It is an impressive sight, this line of Snake priests, bodies painted, pouches, snake whips, and digging sticks in hand, marching single file from their kiva, through the village and down the steep trail that leads from the mesa to the lowlands. When a snake is found under a bush or in his hole, the digging stick soon brings him within reach of the fearless hand; then sprinkling a pinch of corn meal on his snakeship and uttering a charm and prayer, the priest siezes the snake easily a few inches back of the head and deposits him in the pouch. Should the snake coil to strike, the snake whip (two eagle feathers secured to a short stick) is gently used to induce him to straighten out. At sunset they return in the same grim formation, bearing the snake pouches to the kiva, where four jars (not at all different from their water jars) stand ready to receive the snakes and hold them till the final or ninth day of the ceremony. On the next three mornings, just before dawn, in the Antelope Kiva, is held the symbolic marriage of Tiyo and the Snake Maiden, followed by the singing of sixteen traditional songs. Just before sunset of the eighth day, the Antelope and Snake priests give a public pageant in the plaza, known as the Antelope or Corn Dance. It is a replica of the Snake Dance, but shorter and simpler, and here corn is carried instead of snakes. On the morning of the ninth and last day occurs the Sunrise Corn Race, when the young men of the village race from a distant spring to the mesa top. The whole village turns out to watch from the rim of the mesa, and great merriment attends the arrival of the racers, the winner receiving some ceremonial object, which, placed in his corn field, should work as a charm and insure a bumper crop. In 1912, Dr. Byron Cummings witnessed a more interesting sunrise race than the writer has ever seen or heard described by any other observer. An aged priest stood on the edge of the mesa, before the assembled crowd of natives and visitors, and gave a long reverberating call, apparently the signal for which the racers were waiting, for away across the plain below and to the right was heard an answering call, and from the left and far away, another answer. Eagerly the crowd watched to catch the first glimpse of the approaching racers, for there was no one in sight for some time, from the direction of either of the answering calls. Finally mere specks in the distance to the right resolved themselves into a line of six men running toward the mesa. As they came within hailing distance they were greeted by the acclamations of the watchers. These runners were Snake priests, all elderly men, and as each in turn reached the position of the aged priest at the mesa edge, he received from that dignitary a sprinkling of sacred meal and a formal benediction, then passed on to the Snake Kiva. Before the last of these had appeared, began the arrival of the young athletes from across the plain to the left. Swiftly them came, and gracefully, their lithe brown bodies glistening in the early sunlight, across the level lowland, then up the steep trail, to be met at the mesa edge by a picturesque individual carrying a cow bell and wearing a beautiful garland of fresh yellow squash blossoms over his smooth flowing, black hair, and a girdle of the same lovely flowers round his waist, with a perfect blossom over each ear completing his unique decoration. As the athletes, one at a time, joined him they fell into a procession and, led by the flower bedecked individual, they moved gracefully in a circle to the rhythmic time of a festive chant and the accompaniment of the cow bell. When the last racer had arrived, they were led in a sort of serpentine parade toward the plaza. But before they reached that point they encountered a waiting group of laughing women and girls in bright-colored shawls, whose rollicking role seemed to be that of snatching away from the young men the stalks of green corn, squash, and gourds they had brought up from the fields below. The scene ended in a merry skirmish as the crowd dispersed. Later, Dr. Cummings unobtrusively followed the tracks of the priests back along their sunrise trail and out across the desert for more than two miles, to find there a simple altar and nine fresh prayer-sticks. About noon occurs the snake washing in the kiva. This is not for the public gaze. If one knows no better than to try to pry into kiva ceremonies, he is courteously but firmly told to move along. "The Snake priests, who stood by the snake jars which were in the east corner of the room, began to take out the reptiles and stood holding several of them in their hands behind Supela (the Snake Priest), so that my attention was distracted by them. Supela then prayed, and after a short interval, two rattlesnakes were handed him, after which venomous snakes were passed to the others, and each of the six priests who sat around the bowl held two rattlesnakes by the necks with their heads elevated above the bowl. A low noise from the rattles of the priests, which shortly after was accompanied by a melodious hum by all present, then began. The priests who held the snakes beat time up and down above the liquid with the reptiles, which, although not vicious, wound their bodies around the arms of the holders. "The song went on and frequently changed, growing louder, and wilder, until it burst forth into a fierce, blood-curdling yell, or war cry. At this moment the heads of the snakes were thrust several times into the liquid, so that even parts of their bodies were submerged, and were then drawn out, not having left the hands of the priests, and forcibly thrown across the room upon the sand mosaic, knocking down the crooks and other objects placed about it. As they fell on the sand picture, three Snake priests stood in readiness, and while the reptiles squirmed about or coiled for defense, these men with their snake whips brushed them back and forth in the sand of the altar. The excitement which accompanied this ceremony cannot be adequately described. The low song, breaking into piercing shrieks, the red-stained singers, the snakes thrown by the chiefs and the fierce attitudes of the reptiles as they lashed on, the sand mosaic, made it next to impossible to sit calmly down and quietly note the events which followed one another in quick succession. The sight haunted me for weeks afterward, and I can never forget this wildest of all the aboriginal rites of this strange people, which showed no element of our present civilization. It was a performance which might have been expected in the heart of Africa rather than in the American Union, and certainly one could not realize that he was in the United States at the end of the nineteenth century. The low, weird song continued while other rattlesnakes were taken in the hands of the priests, and as the song rose again to the wild war cry, these snakes were also plunged into the liquid and thrown upon the writhing mass which now occupied the place of the altar. Again and again this was repeated until all the snakes had been treated in the same way, and reptiles, fetishes, crooks, and sand were mixed together in one confused mass. As the excitement subsided and the snakes crawled to the corners of the kiva, seeking vainly for protection, they were pushed back in the mass, and brushed together in the sand in order that their bodies might be thoroughly dried. Every snake in the collection was thus washed, the harmless varieties being bathed after the venomous. In the destruction of the altar by the reptiles, the snake ti-po-ni (insignia) stood upright until all had been washed, and then one of the priests turned it on its side, as a sign that the observance had ended. The low, weird song of the snake men continued, and gradually died away until there was no sound but the warning rattle of the snakes, mingled with that of the rattles in the hands of the chiefs, and finally the motion of the snake whips ceased, and all was silent." Several hours later these snakes are used in the public Snake Dance, and until that time they are herded on the floor of the kiva by a delegated pair of snake priests assisted by several boys of the Snake Clan, novices, whose fearless handling of the snakes is remarkable. Already (on the eighth day) in the plaza has been erected the Kisa, a tall conical tepee arrangement of green cottonwood boughs, just large enough to conceal the man who during the dance will hand out the snakes to the dancers. Close in front of the Kisa is a small hole made in the ground, covered by a board. This hole symbolizes the sipapu or entrance to the underworld. Figure 9.—Antelope Priest with Tiponi.—Courtesy Arizona State Museum. At last comes the event for which the thronged village has been waiting for hours, and for which some of the white visitors have crossed the continent. Just before sundown the Antelope priests file out of their kiva in ceremonial array—colorfully embroidered white kilts and sashes, bodies painted a bluish color with white markings in zigzag lines suggestive of both snakes and lightning, chins painted black with white lines through the mouth from ear to ear, white breath feathers tied in the top of their hair, and arm and ankle ornaments of beads, shells, silver, and turquoise. (See Figure 9.) 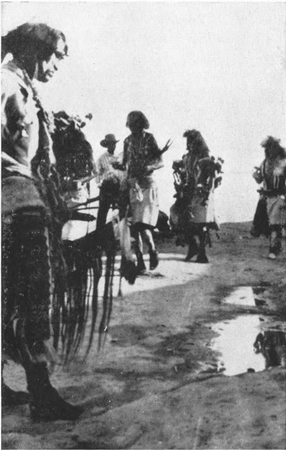 Led by their chief, bearing the insignia of the Antelope fraternity and the whizzer, followed by the asperger, with his medicine bowl and aspergill and wearing a chaplet of green cottonwood leaves on his long, glossy, black hair, they circle the plaza four times, each time stamping heavily on the sipapu board with the right foot, as a signal to the spirits of the underworld that they are about to begin the ceremony. Now they line up in front of the Kisa, their backs toward it, and await the coming of the Snake priests, for these Antelope priests, with song and rattle, are to furnish the music for the Snake Dance. There is an expectant hush and then come the Snake priests, up from their kiva in grim procession, marching rapidly and with warlike determination. You would know them to be the Snake priests rather than the Antelope fraternity by the vibration of their mighty tread alone, even if you did not see them. Their bodies are fully painted, a reddish brown decorated with zigzag lightning symbols and other markings in white. The short kilt is the same red-brown color, as are their mocassins, the former strikingly designed with the snake zigzag and bordered above and below this with conventionalized rainbow bands. Soft breath feathers, stained red, are worn in a tuft on the top of the head, and handsome tail feathers of the hawk or eagle extend down and back over the flowing hair. A beautiful fox skin hangs from the waist in the back. Their faces are painted black across the whole mid section and the chins are covered with white kaolin—a really startling effect. Necks, arms, and ankles are loaded with native jewelry and charms, sometimes including strings of animal teeth, claws, hoofs, and even small turtle shells for leg ornaments, from all of which comes a great rattling as the priests enter the plaza with their energetic strides. Always a hushed gasp of admiration greets their entrance,—an admiration mixed with a shudder of awe. Again the standard bearer, with his whizzer or thunder-maker, leads, followed by the asperger, and we hear the sound of thunder, as the whizzer (sometimes called the bull-roarer) is whirled rapidly over the priest's head. The chapleted asperger sprinkles his charm liquid in the four directions, first north, then west, south, and east. They circle the plaza four times, each stamping mightily upon the cover of the sipapu as they pass the Kisa. Surely, the spirits of the underworld are thus made aware of the presence of the Snake Brotherhood engaged in the traditional ritual. Incidentally, this Snake Dance is carried on in the underworld on a known date in December, and at that time the Hopi Snake men set up their altar and let the spirits know that they are aware of their ceremony and in sympathy with them. Figure 10.—Snake Priests in Front of Kisa.—Courtesy Arizona State Museum. Now the procession lines up facing the Antelope priests in front of the Kisa, (See Figure 10), and the rattles of both lines of priests begin a low whirr not unlike the rattle of snakes. All is perfectly rhythmic and the Snake priests, with locked fingers, sway back and forth to the music, bodies as well as feet keeping time, while the Antelopes mark time with a rhythmic shuffle. At last they break into a low chant, which increases in volume, and rising and falling goes on interminably. At last there is a pause and the Snake priests form into groups of three, a carrier, an attendant, and a gatherer. Each group waits its turn before the Kisa. The carrier kneels and receives a snake from the passer, who (with the snake bag) sits concealed within the Kisa. As he rises, the carrier places his snake between his lips or teeth, usually holding it well toward the neck, but often enough near the middle, so that its head may sometimes move across the man's face or eyes and hair, a really harrowing sight. The attendant, sometimes called the hugger, places his left arm across the shoulder of the first dancer and walks beside and a step behind him, using his feather wand or snake whip to distract the attention of the snake. (See Figure 11.) Just behind this pair walks their gatherer, who is alertly ready to pick up the dropped snake, when it has been carried four times around the dance circle; sometimes it is dropped sooner. The dance step of this first pair is a rhythmic energetic movement, almost a stamping, with the carrier dancing with closed eyes. The gatherer merely walks behind, and is an alertly busy man. The writer has seen as many as five snakes on the ground at once, some of them coiling and rattling, others darting into the surrounding crowd with lightning rapidity, but never has she seen one escape the gatherer, and just once has she seen a snake come near to making its escape. This was during the ceremony at Hotavilla last summer (1932); the spectators had crowded rather close to the circle, and several front rows sat on the ground, in order that the dozens of rows back of them might see over their heads. As for the writer, she sat on a neighboring housetop, well out of the way of rattlers, red racers, rabbit snakes, and even the harmless but fearsome-looking bull snake from 3 to 5 feet long. Often the snake starts swiftly for the side lines, but always without seeming haste the gatherer gets it just as the startled spectators begin a hasty retreat. If the snakes coils, meal is sprinkled on it and the feather wand induces it to straighten, when it is picked up. But this time the big snake really got into the crowd, second or third row, through space hurriedly opened for him by the frightened and more or less squealing white visitors. The priest was unable to follow it quickly without stepping on people, who had repeatedly been warned not to sit too close. Very quietly and without rising, a man in the third row picked up the snake and handed it to the gatherer. The writer shuddered but did not realize that the impromptu gatherer was her son, so bronzed by a summer's archaeology field trip that she did not recognize him. Afterward he merely said, "It was a harmless bull snake, and the priest couldn't reach it; it's a shame for visitors to crowd up and get in the way unless they are prepared to sit perfectly still, whatever happens." Really one feels ashamed of the squealing and frightened laughter of careless white visitors who stand or sit nearer than they should and then make an unseemly disturbance when a snake gets too close. The priests resent such conduct, but always go right on without paying any attention to it. The rattles and singing voices of the Antelope priests furnish a dignified, rhythmic accompaniment throughout the dance, and the Snake men move in perfect time to it. When all the snakes have been carried and the last one has been dropped from the mouth of the carrier, the chant ceases. A priest draws a great round cloud symbol on the ground. Quickly the Hopi maids and women, (a small selected group), who stand ready with baskets of meal, sprinkle the ground within the circle. At a signal all the snakes, now in the hands of the gatherers and the Antelope priests, are thrown upon this emblem. The women hastily drop sacred meal on the mass of snakes, then a second signal and the Snake priests grab up the whole writhing mass in their hands and run in the four directions off the steep mesa, to deposit their Elder Brothers again in the lowlands with the symbolic sacred meal on their backs, that they may bear away to the underground the prayers of their Younger Brothers, the Snake Clan. The Antelope priests now circle the plaza four times, stamping on the sipapu in passing, and then return to their own kiva, and the dance is over. The Snake priests presently return to the village, still running, disrobe in their kiva and promptly go to the nearest edge of the mesa, where the women of their clan wait with huge bowls of emetic (promptly effective) and tubs of water for bathing. This is the purification ceremony which ends the ritual. Immediately the women of their families bring great bowls and trays of food and place them on top of the Snake Kiva, and the men, who have fasted all day and sometimes longer, enjoy a feast. A spirit of relief and happiness now pervades the village and everybody keeps open house. Far more often than otherwise, rain, either a sprinkle or a downpour, has come during or just at the close of the dance, and the people are thankful and hopeful, for this is often the first rain of the season. The writer has herself stood soaked to the skin by a thunder shower that had been slowly gathering through the sultry afternoon and broke with dramatic effect during the ceremony. The Snake priests were noticeably affected by the incident and danced with actual fanatic frenzy. Those who habitually attend this ceremony from Flagstaff and Winslow and other points within motoring distance (if there is any motoring distance these days) have long ago learned that they would better start for home immediately following the dance, not waiting for morning, else the dry washes may be running bank high by that time and prevent their getting away. The writer has counted more than a hundred marooned cars lined up at Old Oraibi or Moencopi Wash, waiting, perhaps another twenty-four hours, for the ordinarily dry wash to become fordable. One will at least be impressed with the idea that the Snake Dance (a movable date set by the priests from the observation of shadows on their sacred rocks) comes just at the breaking of the summer drouth. The writer has seen in the Snake Dance as many as nine groups of three, all circling the plaza at once. But in recent years the number is smaller, in some villages not more than four, for the old priests are dying off and not every young man who inherits the priesthood upon the death of his maternal uncle (priest) is willing to go on, though there are some novices almost every year. This year (1932) the eleven year old brother of a Hopi girl in the writer's employ went into his first snake dance, as a gatherer, and his sister (a school girl since six) was as solicitous as the writer whenever it was a rattler that Henry had to gather up. But we both felt that we must keep perfectly still, so our expressions of anxiety were confined to very low whispers. Henry was not bitten and if he had been he would not have died. It is claimed and generally believed that no priest has ever died from snake bite, and indeed they are seldom bitten. During the past twenty years the writer has twice seen a priest bitten by a rattler, once a very old priest and once a boy of fourteen. No attention was paid, and apparently nothing came of it. Dr. Fewkes, Dr. Hough, and other authorities, in works already referred to, assert that the fangs of the snakes are not removed, nor are the snakes doped, nor "treated" in any way that could possibly render their poison harmless. Nor is it believed that the Hopi have any antidote for snake bite in their emetic or otherwise. Does their belief make them fearless and likewise immune? Or are they wise in their handling of the snakes, so that danger is reduced to the vanishing point? No one knows. The writer has made no attempt to go into the very numerous minute details of this ceremony, such as the mixing of the liquid for snake washing, the making of the elaborate sand painting for the Snake altar, or descriptions of various kinds of prayer-sticks and their specific uses. Authorities differ greatly on these points and each village uses somewhat different paraphernalia and methods of procedure. These details occupy hours and even days and are accompanied by much prayer and ceremonial smoking, and the sincerity and solemnity of it all are most impressive to any fair-minded observer. The Hopi year is full of major and minor ceremonies, many of them as deeply religious as those already described at some length; others of a secular or social order, but even these are tinged with the religious idea and invariably based on tradition. If many elements of traditional significance have been forgotten, as they undoubtedly have in some instances, nevertheless the thing is kept going according to traditional procedure, and the majority of the participants believe it best to keep up these time-honored rituals. Their migration tales, partly mythical, partly historical, relate many unhappy instances of famine, pestilence, and civil strife, which have been brought upon various clans because of their having neglected their old dances and ceremonies, and of relief and restored prosperity having followed their resumption. Once, bad behavior brought on a flood. Here is the story, and it will explain at least partially, the ceremonial use of turkey feathers. Turkey feathers are much prized for ceremonial uses today. If you want to carry a little present to a Hopi friend, particularly an old man, or an old woman, save up a collection of especially nice looking turkey feathers. They will be put to ceremonial uses and bring blessings to their owners. "In the long ago, the Snake, Horn, and Eagle people lived here (in Tusayan), but their corn grew only a span high, and when they sang for rain the cloud sent only a thin mist. My people then lived in the distant Palatkiwabi in the South. There was a very bad old man there, who, when he met anyone, would spit in his face, blow his nose upon him, and rub ordure upon him. He ravished the girls and did all manner of evil. (Note: Other variants of the legend say the young men were mischievously unkind and cruel to the old men, rather than that an old man was bad. H.G.L.) Baholikonga (big water serpent deity) got angry at this and turned the world upside down, and water spouted up through the kivas and through the fireplaces in the houses. The earth was rent in great chasms, and water covered everything except one narrow ridge of mud; and across this the serpent deity told all the people to travel. As they journeyed across, the feet of the bad slipped and they fell into the dark water, but the good, after many days, reached dry land. While the water, rising around the village, came higher, the old people got on the tops of the houses, for they thought they could not struggle across with the younger people. But Baholikonga clothed them with the skins of turkeys, and they spread out their wings and floated in the air just above the surface of the water, and in this way they got across. There were saved of our people, Water, Corn, Lizard, Horned Toad, Sand, two families of Rabbit, and Tobacco. The turkeys' tails dragged in the water—hence the white on the turkey tail now. Wearing these turkey skins is the reason why old people have dewlaps under the chin like a turkey; it is also the reason why old people use turkey feathers at the religious ceremonies." Hough says that in accord with the belief that the markings on the tail feathers were caused by the foam and slime of an ancient deluge, the feathers are prescribed for all pahos, since through their mythical association with water they have great power in bringing rain.